Here is one of the most desired Zenith tombstones. The radio is a six-tube super-het offering AM and Shortwave. This radio sports a huge brightly lit 6-inch multi-colored dial. The cabinet is all original, showing a tiny amount of wear for all of the decades of use. 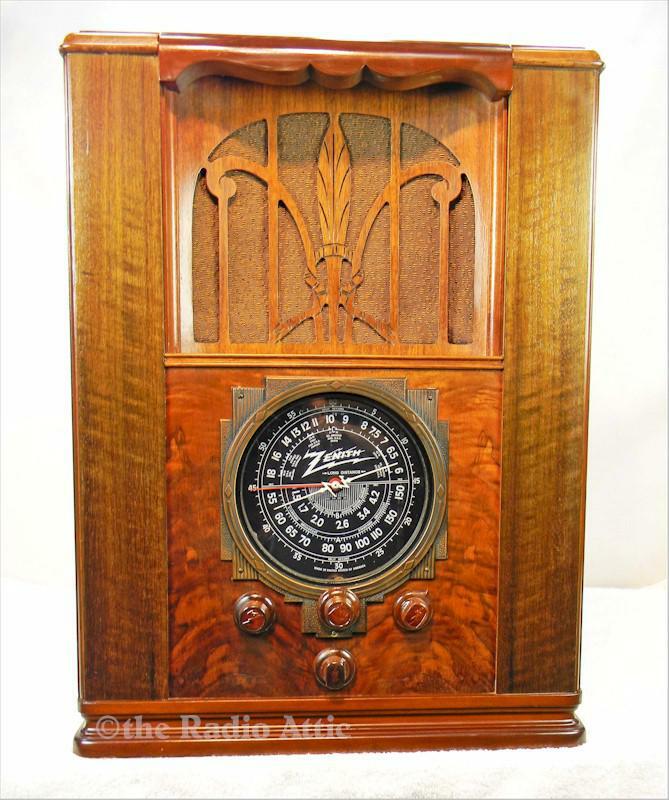 The radio is in remarkable factory original condition, unusual for a 82+ year old set. The speaker cloth is pristine original. This model sports original iconic "Z" knobs. My tech has done a fine job in his repairs. His repairs have returned the electronics to factory new specs. These radios are known for the fine tuning and outstanding sound, and this one offers both. He also added a mini-jack to this radio; with the mini-jack you can connect any modern electronics to it and listen to an unlimited choice of content. This includes your phone, pad, or Internet connection for streaming content. These radios sport huge cabinets and are dramatic playing radios. These are extremely large and shipping will be a bit higher to assure you of a safe delivery. Bluetooth is available for an additional $25! 23"H x 17"W x 14"D.
You are visitor number 797 to this page.